Pregnancy is supposed to be a joyous time, right? People often say that a pregnant women is always glowing. If you are like the majority of women, you may be “glowing”…with a lot of sweat! Growing a human is hard! There are aches and pains and wacky hormone imbalances that aren’t as flattering as the idealistic image so many people portray. At Caron Chiropractic Clinic, we understand that pregnancy is not all fun and games! We offer a variety of services specifically designed for women who are expecting a baby. For prenatal chiropractic care in St Paul, Caron Chiropractic Clinic has got you covered. Chiropractic care during pregnancy is a great option, whether you are experiencing symptoms or not. The fact is, your body is experiencing both physiological and endocrinological changes in order to prep for labor. Even with no complications or pain during pregnancy, chiropractic care during pregnancy can help to establish balance and alignment with the pelvis, making it easier for your baby to get into a good position for delivery. Keeping your spine aligned helps to make your entire body work more efficiently. At our clinic, we deal with both maintenance and stubborn symptoms. Chiropractic care during pregnancy can help to control vomiting, relieve back, neck, and joint pain, prevent a vaginal breech delivery, prevent a potential cesarean section, reduce labor time, and increase the likelihood of a full-term pregnancy. Often, expecting mothers will come into our practice due to pain. As your baby grows, your abdomen protrudes and increases your back curve. This, along with pelvic changes, can make prenatal chiropractic care so important. We can help correct these problems with a simple alignment of the spine. 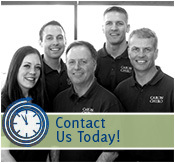 At Caron Chiropractic Clinic, our prenatal chiropractic care in St Paul or our North Oaks offices are phenomenal. The first thing most new moms ask is, is it safe? Chiropractic care during pregnancy is perfectly safe when done by a professional that has been trained to deal with the physical changes that happen during pregnancy. Our trained Chiropractors will work with you to ensure that your baby has the most optimal environment to develop within your womb. We will also provide you with stretches and exercises that help to strengthen you during your pregnancy and compliment adjustments that may have been made to your spine. For more information on the benefits of chiropractic care during pregnancy, call us today! Caron Chiropractic Clinic offers prenatal chiropractic care in St Paul for anyone wanting to gain relief of symptoms while growing a precious baby! So, call us today at (651) 255-9999 and learn how we can help you! This entry was posted	on Tuesday, June 21st, 2016 at 11:38 pm	and is filed under Chiropractic Treatments, Pregnancy. You can follow any responses to this entry through the RSS 2.0 feed. You can leave a response, or trackback from your own site.